Our last house’s front porch was a covered front entry way so you couldn’t really see if it was decorated or not. This year we have a big front porch area begging to be themed, “decked-out” and adored by the fam. for the holidays. Of course when you need any decorating ideas or needing a fun recipe where do you turn to these days…Pinterest-Helloooo! 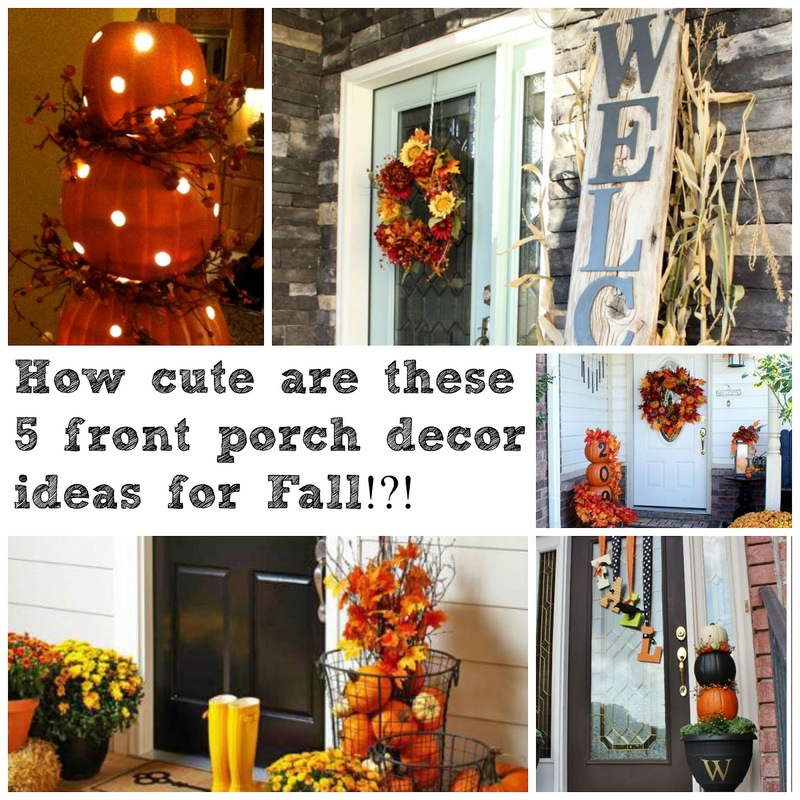 Here are 5 ideas I thought were super cute to give me ideas for decorating our front porch. What I like to do is take a little from here and take a little from there and make it my own. Fall by far is my favorite season, the weather is changing, the trees are turning, the baking gets fun and everyone starts getting into the holiday seasons. I am usually not a full on lets over decorate the whole house, I definitely a minimalist in that respect but. I am jazzed to decorate the front porch for the kiddos so they can feel the festiveness too! Here are some ideas I gathered to inspire me! A growing theme I see is adding your house number to the front of pumpkins and also staking your pumpkins vertically. I like how this front porch is decorated but still looks clean and not overdone. I absolutely adore this sign, here you see the vertical theme of the sign lettering but I would probably do the word harvest instead of welcome and maybe the harvest letters in orange or a burnt orange/red. I also like the idea of placing the pumpkins on the old wood stumps, cute idea! You can check out more of this front door here! This front entry way is semi-traditional but also tying in Halloween themes so it can work for both. Here you see the vertical pumpkins again, you monogram and a fall sign but not your traditional wreath. My personal preference is to decorate for fall, not so much for Halloween theme, but this ties in both with out looking to Halloween themed. In this picture I LOVE the old wire baskets filled with small real pumpkins, so cute! I also like the twig, leaves and mums tying it all together. Very, very, cute!!! Check out more of this front door here! Last but not least, vertical pumpkins again but this is a lit topiary that would be the perfect addition for the front porch, L-O-V-E! I hope these “pin-spired” ideas gave you some ideas for decorating for fall and got the creative juices flowing. I would love to see your front porch themed decor for fall and please tag me so I can see!